Available 4 nights from Tues., July 9, to Sat., July 13: 4 nights $1500. 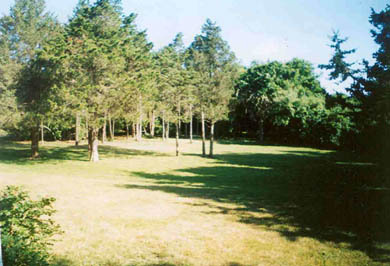 An impeccable, sunny Cape on a ¾ acre lot. The first floor comprises a master bedroom, stall shower, living room, dining area leading to a wrap-around deck, well-equipped kitchen, and a mud-room with washer and dryer. 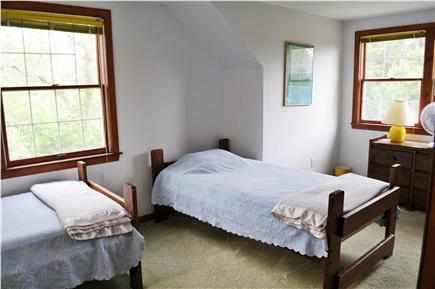 There are two bedrooms on the second floor, each with two twin beds, and a full bathroom between them. A family oriented house provided with loads of games. 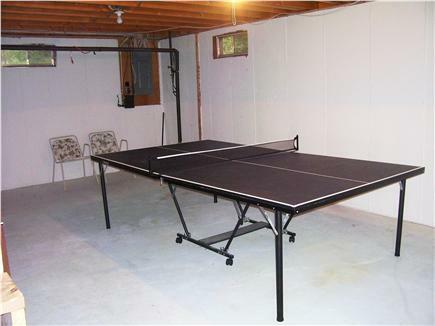 Play ping pong in the clean, dry basement or badminton in the yard. 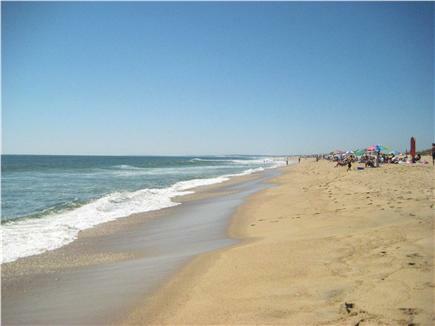 The house is one mile from downtown Edgartown and 2½ miles from beautiful South Beach. You can pick up both the bike path and the frequent town/beach trolley within a ½ mile of the house. Additional pricing info: Available July 9 -19 or any part thereof. Price negotiable, State and local taxes of 9.7% will apply. Our family loves this house! We have rented this house for the past two years and plan to return again next summer. The location and layout are great. It has a big yard, a great deck for grilling and hanging out outside, and it very comfortably sleeps six. The house is located on a quiet street (where our daughter learned to ride her bike this year), and it's only a few miles to the beach. All of our interactions with the owner have been positive, and she is very responsive to any concerns. Vineyard at its best ! We really enjoyed our stay in this house. 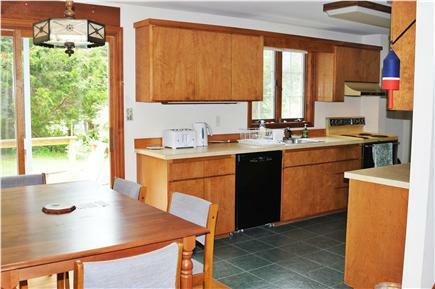 House is spacious and well maintained on a wonderful piece of land. 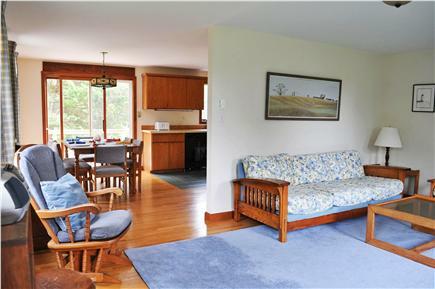 It is very private and close to town and beaches. We loved the large back deck and large / clean outdoor shower. We look forward to coming back for future vacations. This is the one to go back to! Perfect! 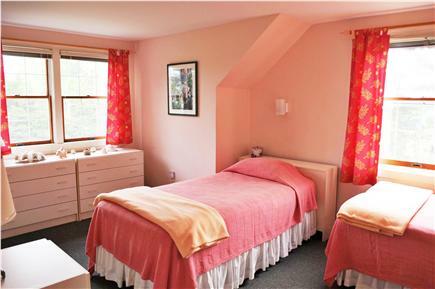 Immaculate, comfortable, and well-equipped in every respect (kitchen as well as games and other amenities). Great location too! We look forward to returning next year! We found the house to be very clean, well maintained and comfortable. The large spacious yard offered ample privacy and the deck was a wonderful place to have dinner after a day at the beach. 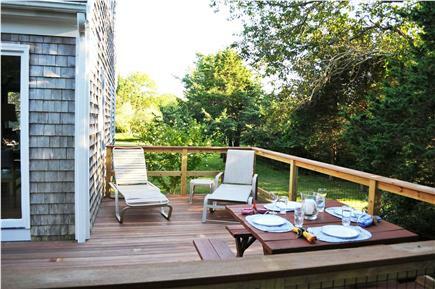 The close proximity to Edgartown is an added bonus - highly recommend this vacation home! This house is very welcoming, the price, comfort & location can't be beat. 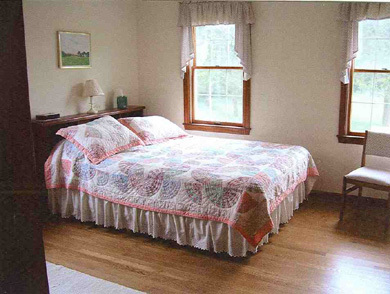 It's close to the bike paths & walking distance to Edgartown village. I would recommend this home to my friends anytime. This is a relaxing getaway, we look foward to next year's vacation ! Lovely home in a quiet neighborhood. Very comfortable and well kept! The large backyard provided lots of space for kids to play, while enjoying refreshments on the large spacious deck. 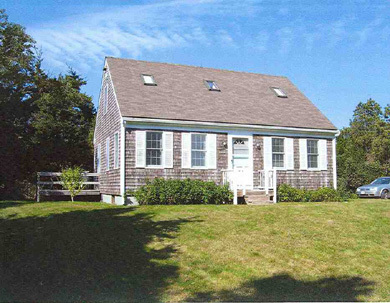 Property is close to Edgartown and a short bike ride to the beach. We will return again and again!